The Voisey's Bay property is located in northern Labrador on a peninsula bordered to the north by Anaktalak Bay and to the south by Voisey's Bay, approximately 35 km southwest of Nain. 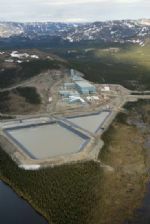 The Voisey’s Bay site includes an open pit mine, concentrator, waste rock storage areas, sedimentation ponds and tailings disposal areas, plus supporting infrastructure including site roads, airstrip, port facilities and an accommodations complex. A diesel generating plant supplies power to the site. The Ovoid deposit contains estimated proven and probable resources of 32 million tonnes, indicating a mine life of approximately 14 years. In addition to the proven and probable reserves in the Ovoid, there are an additional 40 million tonnes of indicated resource and 6 million tonnes of inferred resource available as part of the Voisey's Bay project. Open pit mining at the Ovoid deposit began in August 2005 and processing began in September 2005. The concentrator produces nickel sulphide concentrate (also containing copper and cobalt) and copper sulphide concentrate. The port facility is 11 kilometers away from the concentrator complex at Edward’s Cove in Anaktalak Bay. It includes a dock, a concentrate storage building and equipment for loading concentrate onto arriving ships. Most supplies arrive at Edward’s Cove via ship. The permanent, all-weather airstrip allows workers to be flown in and out of site. The accommodations complex houses up to 300 people. This is where workers sleep, eat, exercise and socialize. Labrador Catering Limited Partnership has provided catering and housekeeping services at the Voisey’s Bay site since 2005. LCLP had previously provided catering and housekeeping services during the development phase of the project.